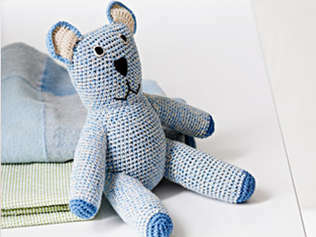 Recently an article appeared in the online magazine for Notebook on how to knit a trauma teddy. This article brought back memories of a time where my children received a teddy each. My children received a trauma teddy after we were caught up in a natural disaster that involved flooding and rain. The local nightly news that I missed at the time and everyone else saw is found here. The Queensland Government had invoked a state of emergency and we were lucky enough to receive some assistance. When the assessor arrived at our door two days after the disaster, a Red Cross volunteer was part of the ‘Disaster Relief Team’. I can not tell you how much those teddy meant to my children and how greatful I am to the Red Cross and the volunteer who visited us that day. Now when I watch news reports from other disaster areas I notice the children walking around clutching these teddies and my heart goes out to those children and their parents. Everytime I think back to that day, I am forever greatful for the assistance that we received and count myself luck that we live in Queensland and not Victoria. My mind boggles when I think about how many teddies are needed in Pakistan at the moment.